I have posted about Hampi and its nearby attractions in length on Instagram and Twitter. Yet every time I refer to Hampi for something there will always be someone asking what all one can do there. Though I am not very fond of “Things to do” post but they do give you a direction to follow. So I am writing this one for the greater good and public welfare :-P. Below are the things that you can indulge in while you are in Hampi. Something that goes beyond saying. How can you come to Hampi and not soak in the architectural marvel of various temples here. The temples are located across the place and they are clubbed in various complexes. Getting a map really helps you in understanding the geographical locations of the temples. And that way you can make the most of the time and visit maximum number of the temples. It is also advised to fix your itinerary around the temples and follow it religiously. There are very high chances of being awe struck with the architecture of one and totally forgetting about the other temples. So plan your day very well in advance. 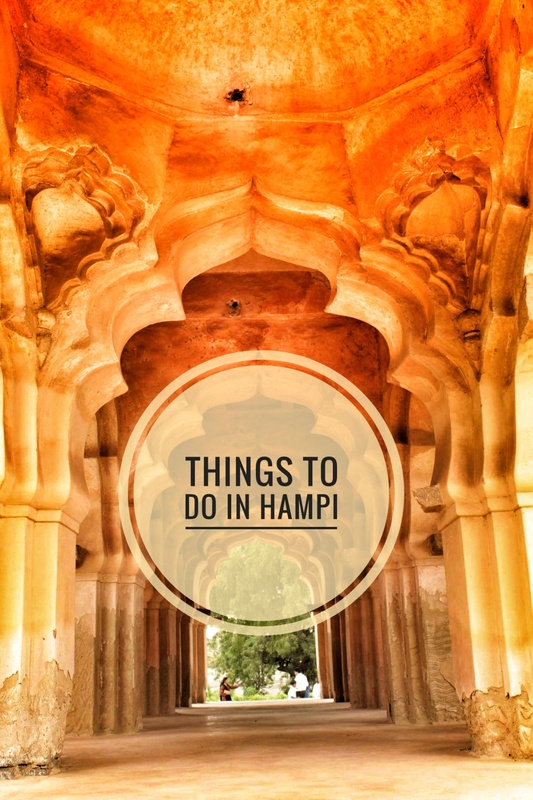 Make sure you spend a day in Hampi Island. To reach the Island you will have to cross the Tungabhandra River. You can do so by taking a ferry or a coracle. The river is hardly two hundred meters wide and hence takes just few minutes to cross. To make it lucid geographically, one side of the river house all the temple complexes and the other Hampi Island. 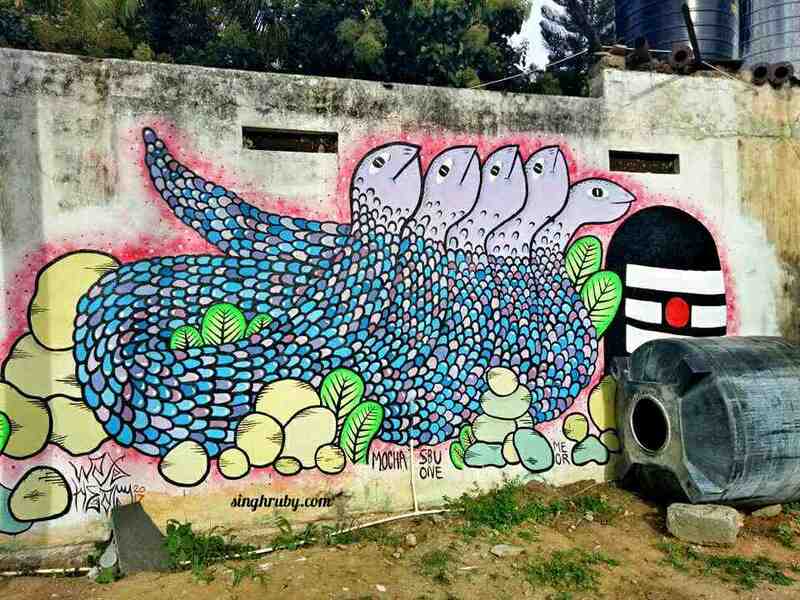 The island is quaint and laid back and Hampi (The Temple Complex) is boisterous and uptight. 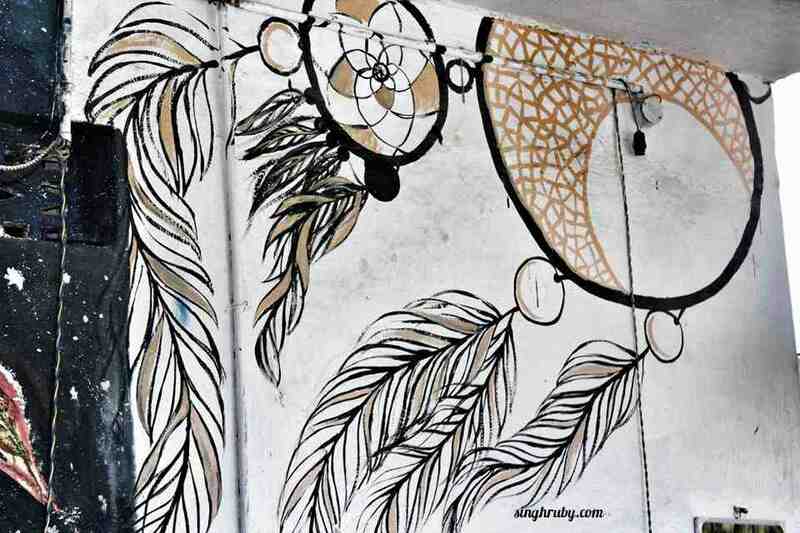 Stroll around the island, enjoy the visual delight of graffiti, street art, eat in some of the quirkiest cafes and just watch the day go by. Hampi Bazar houses many shops and eateries. You could find some really interesting tribal jewelleries and apparel options. It is also a great place to hoard some German Silver and Silver antique jewellery. You would also find shops selling stones and offering healing services. One of my friends opted for Reiki stone healing in the Island Bazar and she thoroughly enjoyed her session. So if that interests you, you can book a session for yourself. These services are available in Hampi Bazar as well. There are many cafes in the Bazar and the best part about almost all of them is that they offer you sit down meals. After hours of walking when you get to fold your legs, sit and eat, it is nothing less than a blessing. Though the temple complexes enjoy close proximity but after a certain point it gets very tiring. The best way is to rent a bicycle and cycle your way around the temples. You could also take your bicycle to Hampi Island. The cycles are available for as low as Rs. 100 for the whole day. Considering the crowd and popularity of the place, auto options are very expensive and simply not worth the price. For all the female solo travelers, be a little vigilant about your surroundings when you cycle in and around Hampi. I was hapless to experiences some things going wrong in Hampi and I wouldn’t anyone else to go through the same. 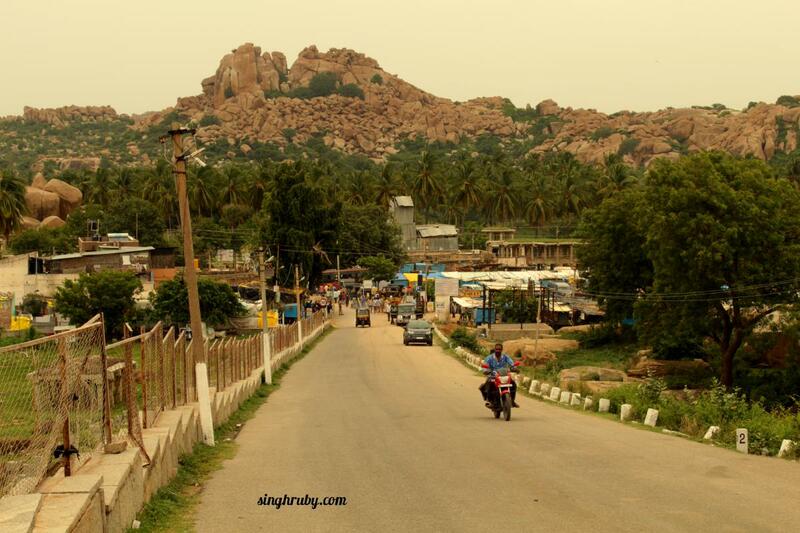 Anegundi is a small village located at the northern side of the Tungabhadra River. To my much surprise this village is older than Hampi. It is popular for its linkage with epic Ramayana. Legend has it that lord Rama and his devotee Shabri met at Pampa Sarovar which is in this village. Rent a bike or a cycle in Hampi Island and roam around the bumpy roads of Anegundi which are surrounded by rice paddies and coconut trees. There will be many times when you will feel like you are in Goa, at least I did. Anegundi is also home to many VIjaynagara era monuments. Make sure you enjoy the sunset when in Hampi. You cannot here and not soak in the orange and red hues of the sunsets. Hire an authorized guide to know the historical and architectural details on the village and temples. Go for bouldering sessions. If you are feeling adventurous then you could try your hands at bouldering. While crossing the Tungabhadra river take the coracle instead of the ferry. 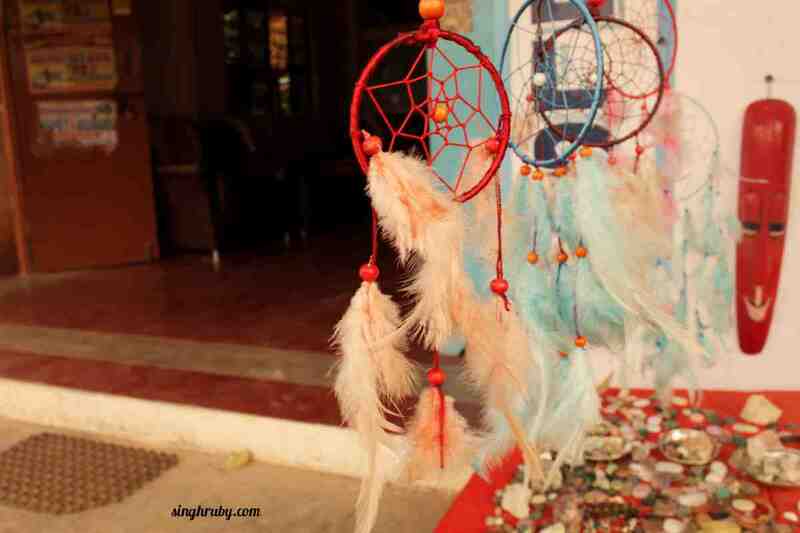 While shopping in Hampi bazar and in Hampi Island make sure you haggle your heart out. Apply sunscreen generously and repeat after every 3-4 hours, I came back home all tan and burnt. Carry water all the time. It is important to hydrate yourself else you could get sun stroke. Carry some candies and chocolate for instant energy boost. Maximum cafes and shops accepts payments from PayTm but it is advised to carry cash. Because of network issues Paytm often gives trouble. By Air: The nearest airport is Hubli and a lot of major airlines are operational on this route. 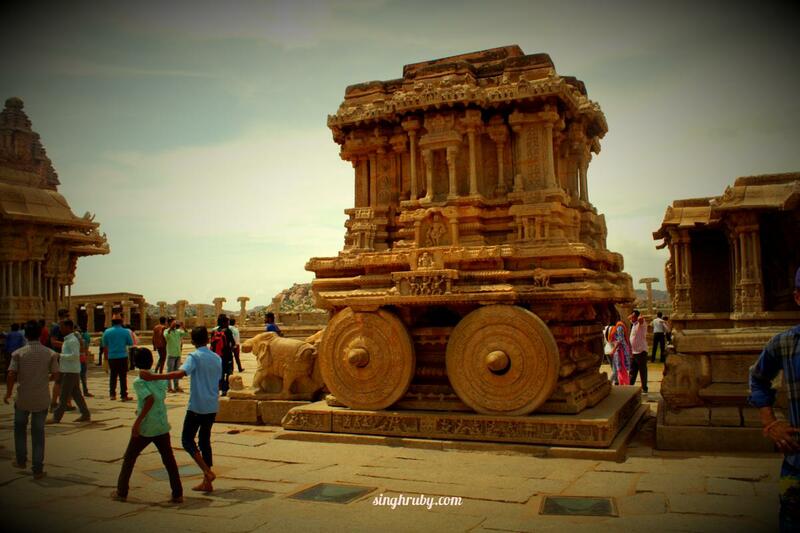 By Bus: There is no bus stop by name of Hampi, so don’t waste your time looking for one. The bus stop name is Hospet. From Hospete take an auto to your hotel or home-stay. By Train: The nearest railway station is Hospet Junction. There is no dearth of places to put up in Hampi. On both sides of the Tungabhadra river there are options galore to pick and choose an accommodation for yourself. If you are on budget then also there are a number of economical home-stay options that you could indulge in. If you are looking for some thing luxury then you may try Vijayshree Resorts. I stayed there and totally loved their hospitality. Exploring the town on a cycle sounds fun! 🙂 That’s something I’d try for sure!